There are over 800 species of chiton. T.lineata have eight overlapping calcium carbonate shells along its outward facing body. The body is oval shaped with an arching exposed dorsal surface. Two parallel gills that take in water anteriorly and expel the water prosteriorly. The central muscular foot is employed for locomotion and adherence to the area it is attached to. This clinging foot works synergistically with the flexibility of the eight shells allowing chitons to fit securely onto rigid or awkward rocky landscapes. Feed using a radula: a ribbon like band of little teeth, mostly grazing on algae. Typically grow to about 2-5 centimeters in length. This extravagantly colored T.lineata is patterned with zigzagging lines in darker browns, grays and slate blues along its shells. There can also be vibrant background or accent colors pink, yellow, orange, green and lavender. T.lineata are mainly herbivorous grazers but they will eat diatoms and small organisms around. Lined chitons relationship with Lithothamnium is a great example of a tropic relationship. Lined chiton are most likely found on rocks that are encrusted in a coralline algae Lithothamnium. This relationship has positive affects for the algae and the chiton. Due to the grazing of the superficial layers of the algae chitons encourage the growth of the algae. In return the pink and grey colors of the algae aid in camouflaging abilities of T. lineata. T.lineata seems to keep a continuously full stomach and intestines although within lab setting there have been no observations of feeding methods. Excretion color aides in understanding what they might be eating outside of their entree of choice Lithothamnium. A pink to whitish color signifies low diatom consumption while a greenish hue signifies a high amount of diatoms in the diet. Most important factor affecting where T.lineata settle is the presence of Lithothamnium. Lined chiton are found attached to rocks and ocean floats in shallow waters in low intertidal and subtidal zones all along the Pacific Coast. Lined chitons like to cohabitate with purple sea urchins and green anemones, rarely are they found alone or in open areas. T.lineata can loose up to 75% of their water supply during low tides then quickly recover when the tide returns. Another way they battle water loss is by moving into tide pools where they can temporarily tolerate the warm, deoxygenated and saltier waters while waiting for high tide. It should be noted that T.lineata are gregarious little guys, upon finding one there should be more close by. Lined chiton show photonegative behaviors, as soon as their are struck with directly sunlight they will move to darker place. As dioecious organisms sexual reproduction is required this is done so without copulation. Males release their sperm into the water as the chiton exhales waste waters. Females pick up the sperm as inhaled water this uptake allows the fertilization to occur within the female. Females create eggs and store them within their mantel cavity. This mantel cavity is where the eggs develop into larvea. Larvea will only settle on areas that are already covered in Lithothamnium. Within twelve hours of being released from the mother chiton T.lineata larvea will quickly shed their larveal coating. Developing seven shells and appearing to look like a tiny chiton. After thirty days they will have fully developed a functioning radula for grazing. T.lineata relies on heavily on oceanic temperature and lunar cycles to initiate their annual reproductive cycle. There is also a strong correlation between timing and latitudinal locations of T.lineata. T.lineata can be hunted by many types of marine animals are many types of sea stars, river otters, and harlequin ducks. 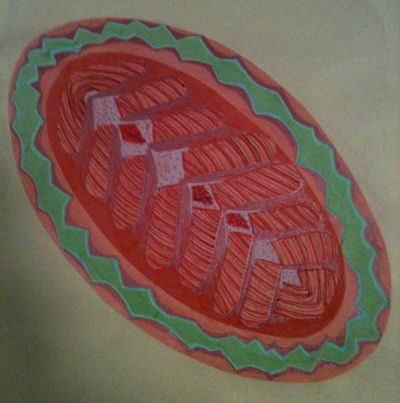 Made with construction paper, pens, colored pencil and love for the happy lined chiton. 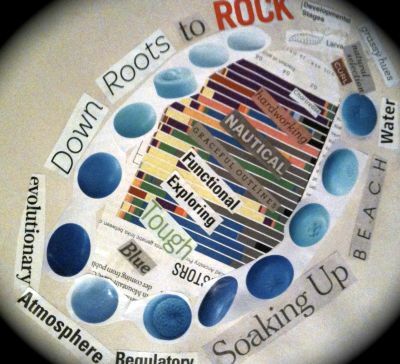 Wordles are a way for students to interpret their organism of study though art. By combining the art of collage and written text with the morphology of an organism students are able to express their feelings and connection with the creature in a creative fashion. This page was last modified on 3 March 2011, at 18:48.